Insight is more than a studio; it is a community of actors who desire to bring a culture of excellence and integrity to the field of the arts. IAS offers a place for acting training where aspiring and professional actors can learn, grow, meet new people, have fun, and feel comfortable. We offer a varied curriculum for all levels of interest, with greater emphasis on small group sessions to reach optimal classroom and acting skill objectives. Our instructors are committed to continual professional development in order to provide our students with the best and most current industry standard of training. 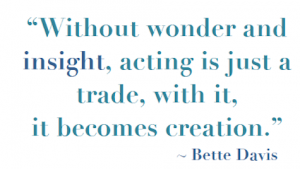 To impart, share, and uncover excellence through acting training. To impart, share, and uncover leadership skills. To become people of vulnerability and inquisitiveness, demonstrative in love and balanced in discourse. To exercise professional skills with integrity, excellence, clarity, and purpose. To develop academic and practical skills for the pursuit of life-long learning. To produce men and women of concern and action in service towards all people. Educational Synthesis: Insight pioneers a unique approach to acting training in the Atlanta area. Our curriculum includes an educational synthesis of academic, vocational, and leadership training modeled in the context of artistic maturity. IAS draws its unique strength from our faculty. Our faculty is a well balanced blend of educators and practitioners rich in traditional and experiential training. We supplement our faculty with exceptional professional guest artists, teachers and speakers. Industry: Insight provides training for students to serve local and global communities and to influence and impact the mainstream arts industries with integrity. Community: While IAS does not provide a boarding school component, our desire is to cultivate a sense of community through local activities. Insight welcomes a wide diversity of teachers and students. Value: IAS operates with maximum value to the student and family, providing quality, affordable, private education for entry into the arts industry.